During a week of giving thanks for blessings, two writing milestones are occurring. In celebration of the occasion, I’ve decided to share with others first. Due to the wonderful support and enthusiasm for Forged in Dreams and Magick, not only has the title remained on the Amazon Best Seller lists since October 1st, but this week, the dollars slid from red into the black. Forged in Dreams and Magick broke even this weekend. This week also marks the one year anniversary of the release of Utterly Loved, a book of poetry shared with the world for charity. More about Utterly Loved can be found here. When we come together for Thanksgiving, it’s to share our bounty with others. As my Charity Support and Awareness page explains, I’m sharing portions of my proceeds with charities. Charities get the first slice of the pie. And then some. They will get ALL of the net proceeds. 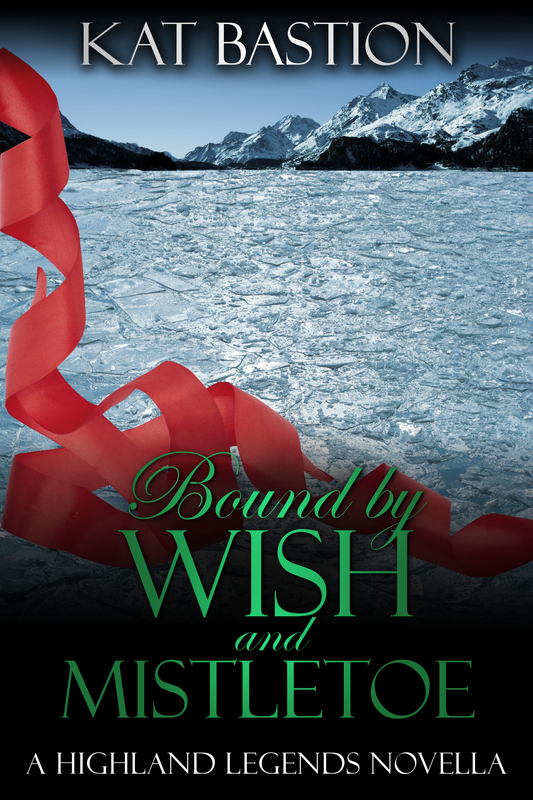 From now through this Sunday, net proceeds of all three books, Forged in Dreams and Magick, Bound by Wish and Mistletoe, and Utterly Loved, in every format, will go to charity. Please join in on the celebration by sharing the news with your friends, family, and social media. If you haven’t yet purchased digital or paperback copies for yourself or others, please consider doing so this week. All three of the Amazon Best Sellers are well priced and make wonderful gifts. Below are the book descriptions and several easy links for your convenience. Digital versions are available at most online locations. Isobel MacInnes wakes up in present-day California, lunches in medieval Scotland, and by ten days’ end, falls in love with a man and his country, only to lose them in a heart-wrenching twist of fate . . .
Found in the arms of her second soul mate . . . Forced to balance the delicate strands of time between two millennia . . . Shocked by revelations rewriting the very foundations of history . . . of everything. Isobel, a rising-star archaeology student, is dropped into two ancient worlds without warning . . . or her permission. Her fiery spirit resists the dependency thrust upon her. Amid frustration at her lack of control, she helplessly falls in love. Twice. She struggles to adjust to the unimaginable demands of two leaders of men—a laird in the thirteenth-century Highlands and a Pict chieftain in a more ancient Scotland. Isobel transforms from an academic, hell-bent on obtaining archaeological recognition, to a woman striving to care for those she loves, and ultimately . . . into a fearless warrior risking everything to protect them. Foreword by New York Times and USA Today Best Selling Author Sylvain Reynard. Thank you for all of your continued support. Together we can make a difference in this world, one small act at a time. Happy Friday and Weekend, everyone! It’s been an exciting week with my One-Year Blogiversary post and a trip down memory lane on Saturday and Bookish Temptations’ first Exclusive Teaser: Forged in Dreams and Magick post, a favorite picnic scene. Enormous gratitude goes to Bookish Temptations for helping me share the teaser with everyone. And now . . . In celebration of the events of the week, I promised party favors to four lucky people who left comments. The four winners who each will receive a $25 Amazon gift card and a signed copy of Utterly Loved are . . . The winners were chosen by Random.org. Let me know who you’d like the signed copy made out to and provide your address through the Kat’s Connections’ contact form on either my blog or my website. Thank you everyone for participating and for your wonderful comments. They mean the world to me. Has it been an entire year already? So many incredible events happened over the course of these first 52 weeks, it feels like my first blog post went up only yesterday. To commemorate a bustling year for a blog meant to chronicle my adventures in writing and publishing, I’ve decided to highlight memorable and favorite moments. The Twitter Trap – Social Media: Blessing and Curse. It’s wonderful to look back at the thoughts and suggestions I gave after being on Twitter for a short six weeks. I’m forever grateful for learning the ropes while trusting my instincts.
. . . or Highlanders . . . or shoes. And let’s not forget the #StilettoSports discussions! I’ve made wonderful friends on Twitter in the past year, lasting connections with kindhearted, generous, and supportive people who are there to interact, laugh, and share love. On August 29, 2012, something seismic happened . . . I posted The Lure of the Great Alpha Male. It was my first post to be reblogged on a fabulous new-to-me back then blog Bookish Temptations. The Lure of the Great Alpha Male is still the most popular daily and weekly post on my blog. It has multiple daily views, and is often the first or second in views for the week. It seems the Lure of the Great Alpha Male is quite undeniable indeed. September 12, 2012 brought to the blog and the world a most unexpected development. I created and shared my first poem Heaven… Found. Surprised to have poetry flow from my heart onto the page, I was thrilled when it was reblogged, liked, and shared on Twitter with everyone raving about the sensual poetry. A burst of poetic creativity followed, which led to the publication of Utterly Loved, a book of romantic poetry for charity which includes a brilliant foreword written by the inspiring humanitarian and New York Times Bestselling Author Sylvain Reynard. Several other poems not included in Utterly Loved can be found in the poetry category on my blog. On October 17, 2012, I gave a glimpse into who I am and how I live my life along with suggestions on how to increase your optimism in the post Adventures of an Optimist. Throughout that day and the next, people contacted me on the blog and social media to let me know how my post brightened their day. To know that I helped others by sharing how I strive to be and stay positive made my day . . . and then some. By October of 2012, I’d posted just over dozen blog posts when I received my first invitation to write a guest post on another blog. The guest post, Embracing Sensuality, appeared Tamie’s blog Bookish Temptations for her one-year blogiversary celebration. I was and still am deeply honored to have been included. In April 2013, in the wake of the devasting bombing at the Boston Marathon, I was invited by Jenn at Argyle Empire to participate in their fundraising efforts for the Red Cross in support of the bombing victims. As a part of those efforts, I shared an experience from my past with the American Red Cross. I revisited that heart-wrenching night and made a plea for donations to the American Red Cross and the Boston One Fund to support those charties in A Glimpse of Heroes. Jenn and Argyle Empire, thank you for wanting me to be a part of such a worthwhile cause. In June of 2013, I became more involved in using my author platform to benefit charities, especially those that fight against human trafficking, by launching the Charity Support and Awareness pages on my blog and website. The page shares my thoughts and feelings, ways we can all help, and links to their various pages. Throughout the entire year, hints and teasers have been posted about my upcoming release, from the series and book names, to the book description, and ultimately to the Cover Reveal on July 9th through AToMR Tours. 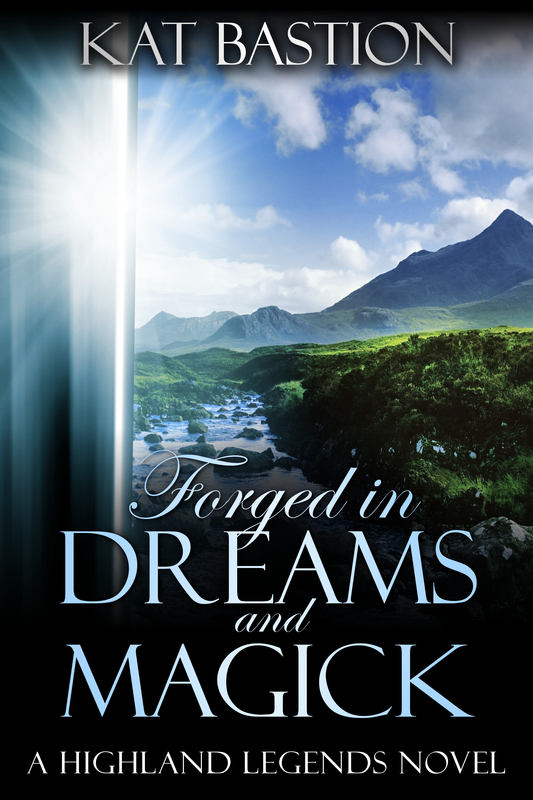 Take a peek at the cover described as “lush” and “stunning” and the description one said “hooked me immediately” for my debut Highlander, time-travel, paranormal romance novel Forged in Dreams and Magick. And . . . there’s one more post I’d like to share as we step off memory lane into the future . . .
I’m thrilled to announce that an exclusive teaser for Forged in Dreams and Magick will be posted on Bookish Temptations on Monday, July 22, 2013. In just two days, that teaser post will mark the two month countdown to the release of Forged in Dreams and Magick on September 23, 2013. I’m giving away a few party favors to commemorate my Blogiversary. Four winners will be chosen by Random.org. Each of the four winners will win a $25 Amazon gift card AND a signed copy of Utterly Loved! It’s easy to enter. All you have to do is leave a comment on this Blogiversary post OR leave a comment on the Bookish Temptations’ Forged in Dreams and Magick teaser post. That’s it! Comments until midnight EST on Thursday July 25, 2013 will qualify for entry to win the giveaway. So leave those comments! I’d love to hear about your favorite moments from my blog over the year. An enormous thank you to all my friends and followers. Your excitement, support, and love along my adventures on the road to published are deeply heartfelt and tremendously appreciated. June is the most popular month for weddings, and a celebrated wedding tradition is the tossing of the bouquet. The bride, overflowing with love and happiness, tosses her bouquet in a symbolic gesture of sharing her good fortune with others. How blessed are we with our good fortune? Warm Bed. Hot meals. A safe home. Those who love us. … Freedom. Let’s all Toss the Bouquet this June. Join me in making a beautiful bouquet of the abundant blessings we have and toss it out to the world. Our flowers will burst into millions of petals, raining love onto those who need it the most. Thoughts, prayers, dreams, and donations all transform into something wonderful for another…all because we tossed a bouquet filled with love. The Toss the Bouquet Charity Event is to raise awareness and help support charities who fight against human trafficking, a pervasive worldwide tragedy that must be stopped. The problem is enormous. And it’s not “over there” … It’s everywhere. How can you participate in Toss the Bouquet? Donate any amount to any of the charities listed on the Charity Support and Awareness page from May 31st through June 15th, 2013. Some of the charities, like Not For Sale and International Princess Project, have stores where you can purchase products to support them. You can do that too! During the event, I’ve also reduced the price of Kindle and paperback versions Utterly Loved. The romantic book of poetry is shared with the world for charity, its proceeds supporting Covenant House and World Vision. 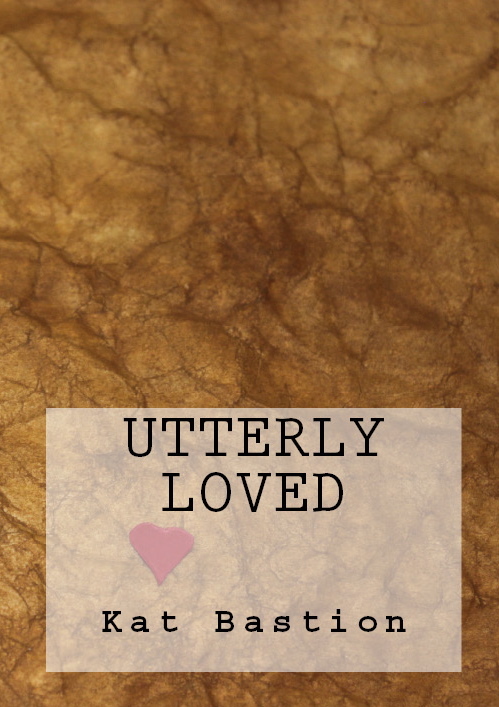 Sylvain Reynard, a humanitarian who inspired me to use my author platform in conjunction with charitable causes, wrote the brilliant and inspiring foreword to Utterly Loved. Be sure to pick up a copy…and perhaps a few to share with others. The Toss the Bouquet Charity Event is all about helping the charities to help those in need. Mr. Bastion and I also wanted to give everyone participating in the Toss the Bouquet Charity Event a chance to win something special. 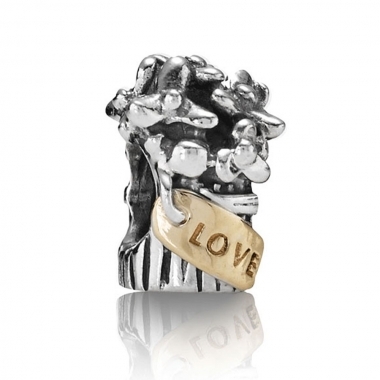 And…one special gift of jewelry from Pandora as a keepsake from the Toss the Bouquet event: Pandora’s sterling silver with 14k gold Love Bouquet charm on Pandora’s sterling silver bracelet. To enter the giveaway, email me at giveaways@katbastion.com with your donation receipt of any amount (or a purchase receipt from one of their stores) for any of the charities listed on the Charity Support and Awareness page by midnight June 15th, 2013 and click on the below link to enter the below Rafflecopter giveaway. Heather Huffman weaves the issue of human trafficking into her stories, is an activist in the cause, and a portion of book proceeds goes toward charities fighting against human trafficking. Read more about her books and human trafficking on Heather’s website. Your purchase of their incredible books supports the authors, who in turn support the charities. Please share this blog post and/or news of the Toss the Bouquet Charity Event and Giveaway with your social media. Encourage your friends and followers to join us in supporting those charities that fight against human trafficking. Let’s set every one of those lost souls free and show them they are utterly loved. Thank you for your generous hearts, my friends. Ready to get real on today’s blog? A horrific topic that no amount of sugar coating ever makes easier to digest. Last night, Mr. Bastion highlighted an hour-long show that was painful and heart-wrenching to watch. I can’t imagine an hour better spent of my time. In my opinion, everyone needs to see the 3AM Girls on Our America by Lisa Ling. To see those who advocates are trying to help by rescuing children who’ve been victimized with no foreseeable escape is beyond moving. You will learn who is taken, how they are taken, and why they can’t leave without significant help. Then you will learn where it is happening. Is it happening worldwide? Yes. Is it happening in your city? Absolutely. Did you see the article in the Huffington Post naming the single largest human trafficking event in the US? The Super Bowl. Now whenever I see a major event, I will always remember those who are there against their will…wishing they were somewhere else. Because of the harsh world we live in, we escape into movies. We get lost in romance novels. Writing and reading of heroes and heroines with happily ever afters helps bring happiness to our otherwise dreary lives. Many of us have a lot to learn about the definition of despair. What struck me most, of the many shocking things I learned last night in the program, was the level emotional abuse these children suffer under once they’ve fallen victim to human trafficking. Oftentimes, they suffered emotional abuse from their homes long before they became lost on the streets. The reason the emotional abuse impacted me so greatly? I’m a survivor of emotional abuse. Not many people know that fact about me. I suffered all my life at the hands of the ones children trust most in this world. I’ve also suffered from the emotional cruelty of bullies. I know how difficult it is to break free of the fear. I understand how it seems like there may never be a sun to rise on the horizon of a new day. I feel I was one of the lucky ones. I didn’t run away from home. No matter how bad it got for me, I endured my homelife with a silent vow to myself on a particularly bad night that I would get out the moment I could afford to support myself. Through the emotional abuse, I somehow repaired all the chipping away of my self-esteem with something stronger. Mr. Bastion met me at the critical moment in my life right as I took the leap away from my abuser and went out into the world. His love and support was instrumental to my survival on my own. He is forever my amazing foundation, as he can attest to the scar tissue and trust issues that I still deal with and recover from. Our talks are great therapy for me and strengthen my resolve to help those who need that same foundation. Those in human trafficking are kept there by similar emotional abuse, only they have fallen into the darkest, most dangerous realm of our world. The odds are against them for getting out alone. Fear, guilt, and manipulation make those children feel they owe it to their captors to remain. They feel they have no other choice. No human on this planet should be trapped in a situation where freedom is not an option. These children need an enormous amount of love and support to escape their circumstances into a better life. I’m very new to the charity awareness scene. While I’ve been raising awareness for charities that support helping human trafficking victims, including World Vision and Covenant House through the promotion of Utterly Loved, I’m learning how great the need is and how much help is required. Click on both of these World Vision and Covenant House links to see the difference donations made in 2012 to help victims of human trafficking and how vast the problem is worldwide and in the United States. A wonderful humanitarian, Sylvain Reynard, opened my eyes to the importance of raising awareness to help those in need through an author platform. He is a huge supporter of both World Vision and Covenant House. Another author who’s just recently come to my attention through Sylvain Reynard is Heather Huffman. She not only donates a portion of the proceeds of her books to help fight human trafficking, she also weaves the important issues into her stories. Check out Heather Huffman’s website here and her What is Trafficking page, which has links to several groups that are involved in helping to save those lost children. Utterly Loved, a book of romantic poetry with inspiring foreword by Sylvain Reynard that highlights the need for ongoing support for these charities, exists because of those lost children. Every purchase of Utterly Loved not only raises awareness of those charities, but all the proceeds every sale (less costs and taxes) supports them. Find Utterly Loved on Amazon, on Barnes and Noble and on Smashwords. Our generosity will help save those young victims. Spreading awareness of the issue is only the first step. Getting involved is critical to making real change and saving lives. Everyone deserves a safe home, a warm bed, a hot meal, and loving hugs. Let’s make it happen for every one of them we can. Why am I an eternal optimist? Why do most of the posts you see on Twitter or on Facebook and in Utterly Loved reflect the love in this world? Because I know that optimism is the only thing that saved me. Believing there is a brighter tomorrow got me through every dark day. Join me in the fight for brighter tomorrows for every lost child out there. Let’s give those children the happily ever after they deserve. Thank you for your enormous hearts and endless support.